We all know the drill. Sitting at our desk, we lean forward in our desk chair to see something on the computer screen. Then we look all the way down at our phone to send a text. Now, rinse and repeat about 100 times a day. It’s not too hard to think that our neck muscles are constantly working against poor posture and ergonomics to help us get through our daily routine. 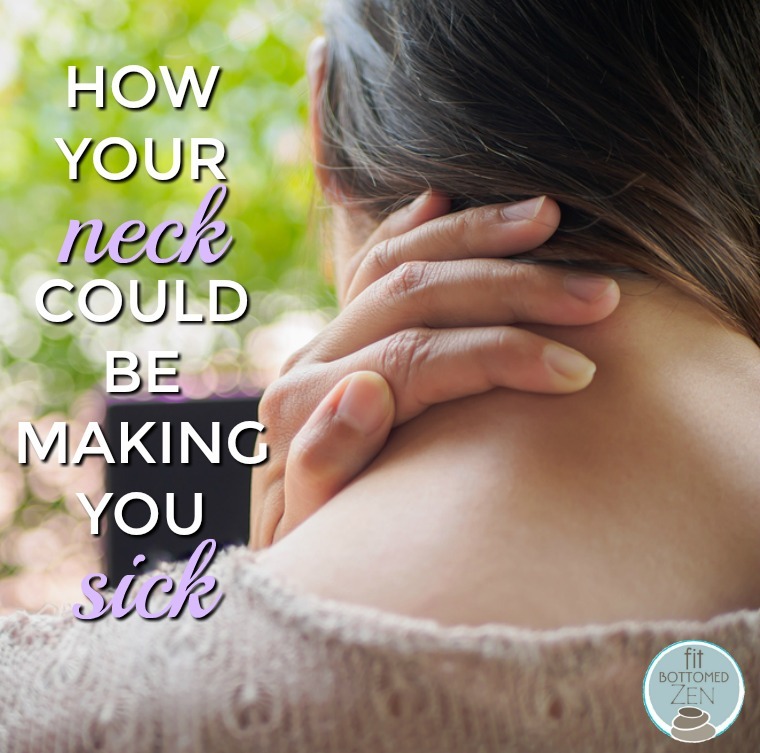 The neck is vital for keeping our heads from completely falling off, but what if our neck was also responsible for keeping us healthy and protecting us from getting sick? The neck is a conduit between the head and the body. It carries nutrients to your brain and food to your stomach. It is also the only pathway for blood, lymph and nerve signals to flow between your head and the rest of you. If your neck muscles are tight due to poor body mechanics, stress, or strain, the flow of everything between head and torso is impeded. It becomes a literal bottleneck. When someone coughs or sneezes nearby, mechanisms (like cilia and mucus membranes) in your own nose and throat will be the first line of defense against these pathogens. When more assistance is needed to defeat the cold or flu germs, white blood cells (WBCs) travel through the lymphatic system to the affected location. These WBCs have to drive through the neck to get from the body to the nose. When tight muscles are in the way, it creates somewhat of a traffic jam in the neck region that makes it difficult for your body to fight the upper respiratory infection adequately. The good news is that you can do something to improve your immune system and feel better at the same time! I’ll give you four excellent ways to help you stay healthier during this cold and flu season! 1. Dress warmly. Your mother was right when she would yell at you to “Bundle up or you’ll catch a cold!” Check the weather report. Wear a scarf, don your favorite turtleneck, or pop up your hoodie to avoid hiking your shoulders up to provide your weather protection. Don’t add unnecessary strain to your neck by being unprepared for cooler weather. Besides, this is the perfect reason to accessorize your wardrobe! 2. Get a massage. Why not treat yourself to a nice neck massage? Not only will it help improve your wellbeing, you’ll also get to relax and pamper yourself! Muscles in the neck can also be responsible for headaches, sinus congestion, dizziness, and ringing in the ears. So, don’t be surprised if you gain other health benefits as well! 3. Stretch it out. Our neck has a tremendous range of motion when properly functioning. But if we don’t continue to use it, we lose it. When was the last time you tried to touch your chin to your chest? Most of us don’t stretch enough as we age — and stiffness can lead to chronic aches and pains. A stretching routine can improve circulation and greatly improve mobility to help restore flexibility and suppleness to the neck. 4. Pay attention to your posture. This is one of the most subtle changes you can make to ease your neck strain. The simple act of keeping the shoulders back and head in line with the torso can reduce the stress on the cervical spine tremendously. An average head weighs 10 pounds, so finding the sweet spot to position your head will allow your muscles a much needed break. Continuous posture correction can save your neck muscles from working overtime!